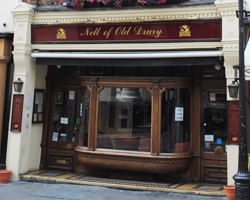 ‘The Nell’, as its known, is one of the area’s oldest pubs – a sign says there has apparently been a pub on the site since before 1660 when the Theatre Royal Drury Lane – located opposite – was built. There’s supposedly an underground tunnel that connects the theatre and the pub which is said to have been used by the king when he was visiting Nell (we’re not sure if it was Nell or the king who was in the pub). It was also apparently used by other theatre-goers who were warned to return to the theatre when intermission was over by a bell located inside the pub. Now located at 29 Catherine Street pub (the street was formerly known as Brydges Street – we’ll deal with its renaming in an upcoming post), was apparently originally called The Lamb and then renamed the Sir John Falstaff in the nineteenth century, during which period it hosted exhibitions featuring a tattooed man from the South Seas and a Zulu warrior woman, before assuming its current moniker. 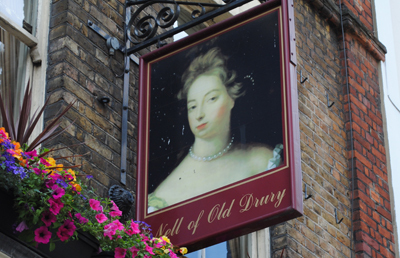 The pub was also apparently a regular for many prominent literary and theatrical figures, not to mention market traders from nearby Covent Garden. The exterior of the pub appears in the Alfred Hitchcock film, Frenzy. For more on the pub, see www.nellofolddrury.com.